Owen's finger being bitten by an extraordinarily aggressive and completely freaked out little anole. The poor thing had just been attacked by a cat and Owen was trying to remove it from the cat's attention. Eventually, his mother freed Owen's finger from the death grip and the little guy skittered away into the leaves. Then Owen picked up a Daddy Long Legs spider. 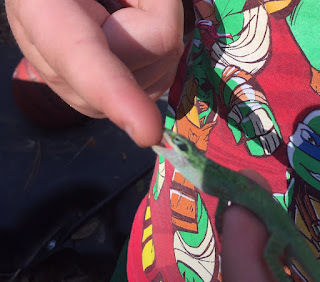 He kept saying afterwards that it had felt good, that lizard biting his finger. He is a brave boy. grandgirl Jade was a big bug and creature lover as a youngster but she grew out of it. Kids go through so many different interests, don't they? I love it. That anole is probably saying, "Whew! I survived! I am the GREATEST!"